DETROIT — The Packers trailed the Lions, 17-0, following two first-quarter touchdowns 48 seconds apart. The Lions won the toss and deferred. The Packers opened at their 18-yard line and quickly divulged their game plan with three consecutive runs. On third-and-1, James Starks was stopped for no gain. Detroit’s first possession began at its 32. A 20-yard pass to Calvin Johnson carried to the Packers 35. On third-and-8, Matt Stafford threw incomplete for Johnson, and the Lions attempted a 51-yard field goal. It was good, 3-0, 8:48 to play in the first quarter. It was announced Quentin Rollins sustained a forearm injury and his return was questionable. 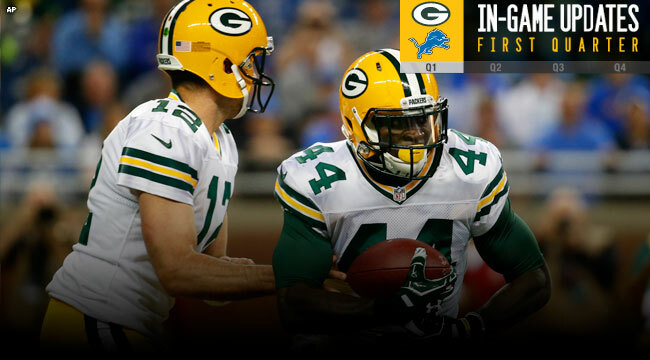 A long gain by James Starks — the starter at running back — on a screen pass was nullified by a facemask penalty against Josh Sitton, a long pass attempt to Jeff Janis fell incomplete, and a 16-yard completion to Jared Abbrederis failed to gain a first down, leaving Tim Masthay to punt. The Lions gained possession at their 24. The Lions quickly moved across midfield, and then rookie running back Ameer Abdullah burst through the line for a 36-yard gain to the Packers 11-yard line. On third-and-2, Stafford threw to tight end Eric Ebron for a touchdown, 10-0, 1:50 to play. Green Bay’s prospects quickly worsened when Aaron Rodgers was intercepted by Glover Quin. His return took the ball to the Packers 17. One play later, Stafford pitched a touchdown pass to Johnson, 17-0, with 1:02 to play. Rodgers’ pass was intended for James Jones in the deep-middle of the field, but it sailed over Jones’ head.